Reader Question: I'm heading down to South America to visit several countries. Do I need to buy an outlet adapter? What about converters? I don't want to ruin my laptop by plugging it into an outlet that is too strong. Answer: The answer isn't so simple. While many people worry about using an iPad in South America or charging their iPhone.South America as the region has not been able to agree on a common outlet to use and it varies from country to country. If you're visiting several countries you need to investigate each one. Some use the typical American two and three prong plug but many use the outlet that is commonly found in central Europe. Many people buy expensive universal outlet adapters from travel stores for South America. If you like to prepare in advance you'll pay North American prices. However, if you arrive in a country that uses a different electrical outlet your hotel should have an adapter on hand. If not, most of the markets will have vendors who sell them for only a dollar or two. It is common for many North Americans to travel to Europe and ruin a hair dryer because they did not bring a transformer to convert the power. In South America travelers have the same worry and often bring large adapters to convert electricity. 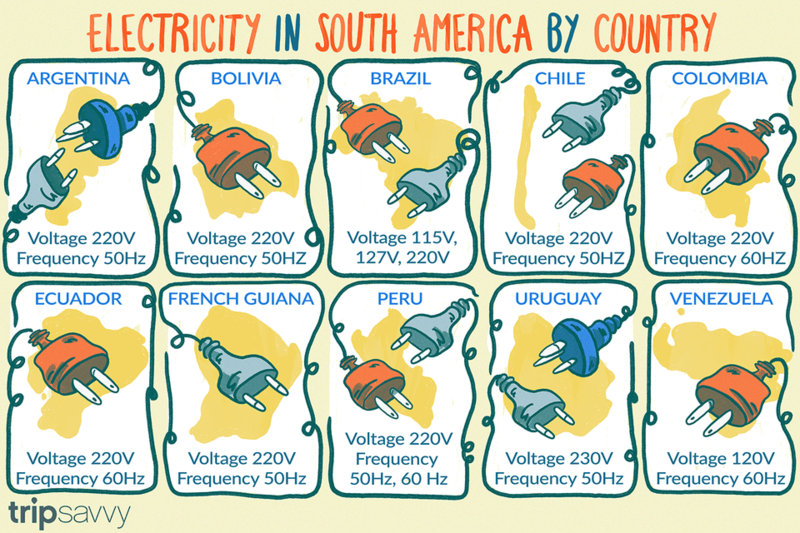 While most European countries use 240 voltage, the US, Canada and much of South America continue to use 120 voltage, Brazil continues to support both types. So have no fear, your hair dryer will be safe in South America. Regardless, you do not need to worry about converting electricity with electronics as most products are able to support both, simply check the back of your laptop for power input details and it should say 100-240V~50-60hz. . This means, you'll only need an adapter to change the shape of your power plug to fit into an outlet. May use one of two types, the typical European rounded two prong plug or a 3 prong plug used in Australia (see image above). Uses the same outlet as the United States. The only country that uses dual voltage. Depending on the region, voltage might be 115 V, 127 V, or 220 V.
Brazil uses a number of different outlets, depending on where you go you may find a typical European round pronged outlet or the American two/three pronged outlet. Uses typical European rounded two prong plug as well as a third rounded prong plug. Uses the typical European two prong plug. Voltage 120V, 60Hz. Conversion of 50 Hz distribution to 60 Hz is ongoing. Voltage 220V, 60Hz although some areas may be 50Hz. There are two types of electrical outlets in Peru; however many electrical outlets are now designed to accept two types of plugs. These outlets will accept the American flat-pronged plug as well as the European style round-prong plug. Read more about electricity and outlets in Peru. May use one of two types, the typical European rounded two prong plug or a 3 prong plug used in Australia. If this all seems confusing the best thing to do is ask the hotel concierge or front desk about the power situation. Most hotels and hostels are very familiar with the differences in outlets and voltage for their area and can give you the best advice. If you like to take extra precautions when traveling it is possible to buy a ​universal power adapter with a bulky transformer attached. It is a bit pricey but may help ease any worry you may have.